If everyone stays home and leaves their money in the bank, velocity is zero. If people go shopping, and those who receive the money spend it too, then velocity grows. Nominal GDP is the gross dollar value of goods and services. It is broken into two parts. One part represents real value and the other represents inflation or deflation. As a simple mathematical equation, the theory is written as M * V = P * Q, where M is money supply, V is velocity, P is a price index and Q is real GDP. Most economists agree that long-run potential growth in a developed economy such as the United States is about 3%. They also agree that price stability is a desirable goal and that neither inflation nor deflation should play much of a role in spending and investment. Monetarists, staring with Irving Fisher in the 1920s and continuing through Milton Friedman in the 1970s, believed that velocity was constant. 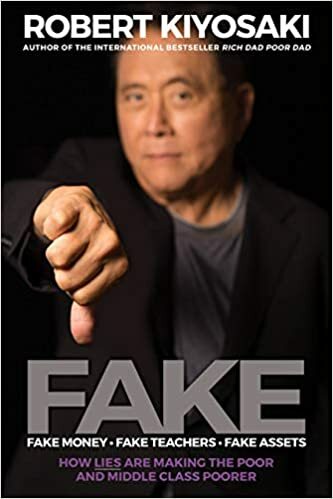 Using these inputs of 3% real growth, price stability and constant velocity, monetarists concluded that a slow, steady increase in the money supply — just enough to accommodate real growth — would produce maximum real growth with no inflation or deflation. This is central bank nirvana. Of course, reality is messier than the theory implies, and there are leads and lags in the response to monetary policy. Real growth could be higher or lower than 3% for certain periods. But the basic idea that steady monetary growth could produce steady economic growth was taken as gospel by Friedman and his followers. There was only one problem with this neat, tidy monetarist theory. Like a lot of economic theories, it worked better in the faculty lounge than in the real world. In particular, one of the core assumptions — that velocity is constant — turns out to be false. As Figure 1 below shows, velocity varies widely over time. 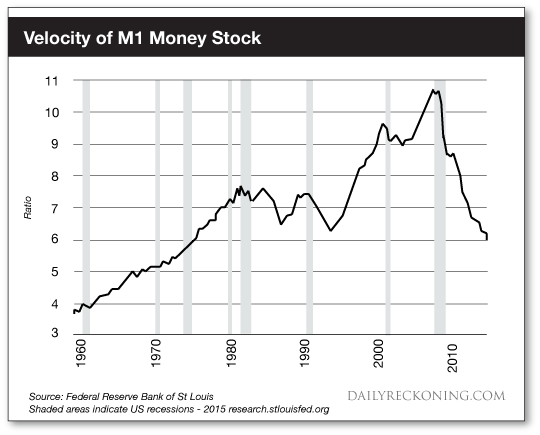 The velocity of the M1 money supply rose from about 4 in 1960 to 7.5 in 1980, before falling to 6.3 in 1993. Then it rose steeply to 10.6 by 2008, before it plunged sharply to 6 again in 2015. It is still falling today. This plunge in velocity explains why Federal Reserve money printing since 2008 has not produced much inflation. Many analysts and bloggers have been saying for years that Fed money printing would produce an outbreak of inflation. If velocity actually were constant, the 300% increase in the Fed’s balance sheet would have produced massive inflation by now. The collapse in velocity shows why that has not happened. The money is available, but people are not spending it. Instead, they are saving it or paying off debts — a form of deleveraging. The quantity theory of money is a useful tool for conducting thought experiments about alternative scenarios because it sets certain important economic variables in a relationship with others. 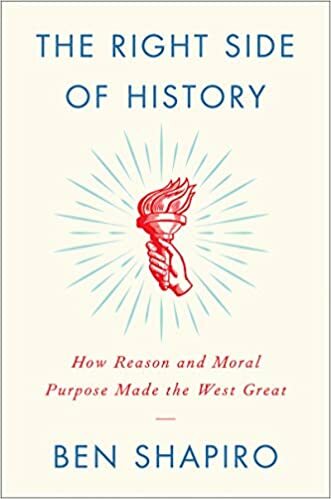 But as a guide to policy or as a forecasting tool, it has little value because one of its key variables — velocity — is independent of the others and difficult to predict. In order to understand velocity, we have to move out of economics and into the realms of technology and psychology. Velocity depends on psychology above all. If people feel certain about their future incomes, job security and the economy in general, they are much more likely to borrow and spend. Conversely, if they are worried about their jobs and unsure about public policies like tax rates and health care costs, they are more likely to save and pay down debt. This dynamic is different than the fictitious “wealth effect” that central bankers rely on. The wealth effect says that by offering zero rates of interest on bank deposits, savers will channel investment into stocks and real estate instead. The resulting increase in asset values will make people more likely to spend. Research shows that this is mostly nonsense. The impact of channeling investment into stocks and real estate with artificially low rates produces asset bubbles. When the bubbles burst, confidence is shattered and velocity declines even more. This is clearly visible in Figure 1 where the velocity drop started with the LTCM crisis in 1998 and the dot-com crash in 2000. Then, after another round of easy money and a velocity rebound, it plunged disastrously again in 2008. Velocity is mostly about confidence. When confidence in the future is low, as it is now, velocity declines and deflationary pressures persist. Confidence is likely to be weak at least through the 2016 elections, and perhaps beyond, because of policy stalemates between the White House and Congress. Technology also plays a role in causing deflation. As technology drives prices lower, consumer expectations shift. Lower prices become the norm, not the exception. Consumers are no longer in a hurry to buy things before prices go up. Instead, they are content to wait until prices go down. This waiting reduces velocity even more and feeds on itself as lower prices produce more waiting, which causes even lower prices. These deflationary price pressures are seen clearly in Figure 2, which shows the headline and core producer price indexes since November 2010. 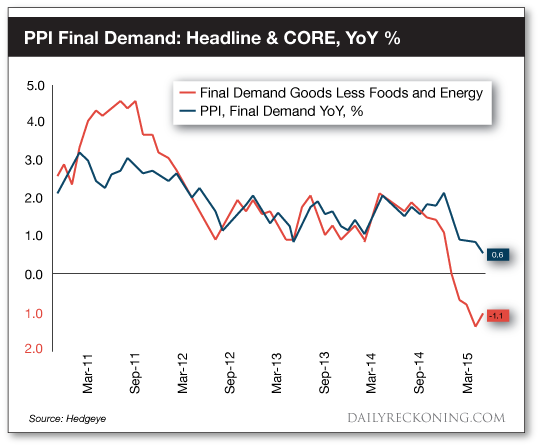 The overall index is already in deflationary territory, and the core index is moving in that direction. The impact of technology on prices comes from two distinct trends — optimization and disintermediation. Optimization refers to a host of linear programming and similar modeling techniques that show companies how to produce more with less. By finding efficiencies in logistics, scheduling, inventory management and supply chains, companies can pass the savings along to customers in the form of lower prices. Disintermediation refers to the disruptive process by which new companies, mostly Web-based, connect sources of supply and demand by going around traditional brokers, gatekeepers and agents. Examples include companies like SoFi, which provides private student loans without banks, and Amazon, which provides shopping without stores. It has been remarked that Uber is the world’s largest taxi company but owns no taxis; Airbnb is the world’s largest lodging company but owns no real estate; and Facebook is the world’s largest advertising company yet provides no content. All of these companies are not only disrupting existing business models but are lowering costs to consumers in the process. This process feeds expectations of lower prices in the future and further reduces velocity and increases deflationary pressures. For now, the Federal Reserve is stymied. The psychological, technological and demographic trends causing deflation are not going away. The Fed cannot tolerate deflation because it increases the real value of debt and jeopardizes the banks. The Fed will be forced to return to its inflation tool kit of quantitative easing, currency wars and perhaps “helicopter money” in the year ahead. These dominant economic trends — natural deflation countered by policy inflation — produce a rich set of indications and warnings. These models use complexity theory and behavioral psychology, among other tools, to identify trends in their early stages and to foresee companies that are more likely to succeed or fail based on those trends. French President Francois Hollande is holding an emergency meeting of his country’s defense council after newly published documents reveal American agents had spied on him and his two predecessors. According to the documents, released by Wikileaks between 2006 and 2012, the National Security Agency spied on the three French presidents by listening in on their work and personal phone calls. Boom Bust’s Ameera David weighs in. Erin Ade sits down with Jim Rickards – chief global strategist at West Shore Funds and author of "The Death of Money. "Between Greece attempting to come to an agreement with creditors, lifting Iran sanctions, and a stable Chinese economy, Jim tells us where we are in the currency wars timeline and gives us his take on why we have trade agreements at all. Afterwards, Bianca Facchinei takes a look at the rising cost of rent across the United States. Rent has been on a steady rise for a while, causing an especially difficult time for the lower class. But coupled with other issues in our economy, the middle class is struggling now, too. After the break, Ameera and Erin discuss the Senate voting to advance President Obama’s trade agenda by approving a measure to allow fast-track authority – paving the way for the Trans-Pacific Partnership to follow through. RT correspondent Lizzie Phelan looks into the latest from Greece, where officials met with eurozone ministers today in yet another attempt to negotiate and strike a deal with its creditors. And in The Big Deal, Ameera and Edward Harrison discuss countries that are at risk of defaulting. Greece is not the only one. It is not even the most likely to default. Greece is in the limelight because it is a member of the eurozone. Jim Rickards on Greece debt crisis, China, Iran and Trade, Industry. 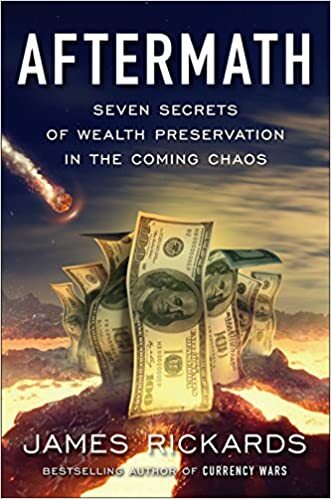 Jim Rickards – chief global strategist at West Shore Funds and author of "The Death of Money." Between Greece attempting to come to an agreement with creditors, lifting Iran sanctions, and a stable Chinese economy, Jim tells us where we are in the currency wars timeline and gives us his take on why we have trade agreements at all. 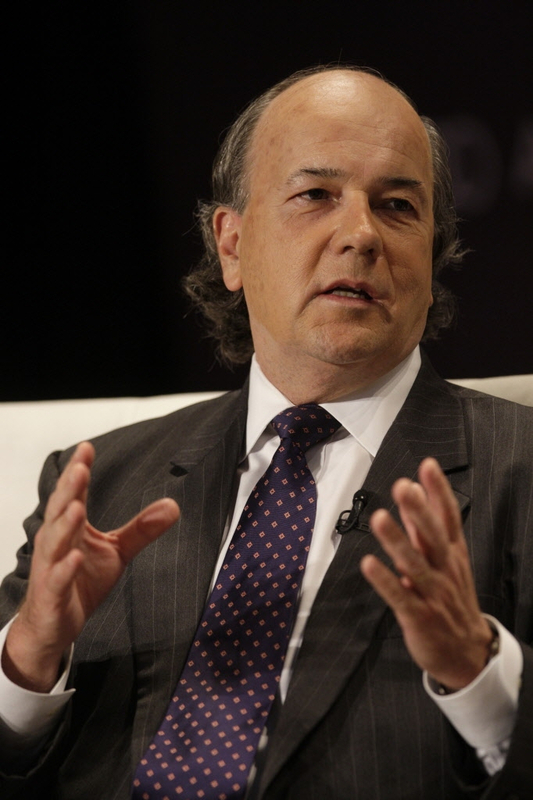 Jim Rickards - Greek Exit From EU Not An Inevitability?